History of the FISA Design: The FISA hull was developed at the request of FISA, the international governing body for the sport of rowing. Initially hull shapes for 1x, 2x/2- and 4x/4- were designed for open women and lightweights. In 1987, the first FISA hull was rowed to a World Championship gold medal. Since then, many successful crews have chosen to use the FISA hull and it has become the de facto standard at the World Championships. In 2008, we reintroduced the FISA Single in carbon construction coinciding with a move from Europe to Canada. We offer two hull capacities: the FISA (Standard Displacement) and FISA II (Large Displacement) hull shape. The FISA II hull is 1/2″ deeper and 1/4″ wider than the original FISA hull. Both boats are the same length. All the boats are equipped with Dreher carbon seats, Dreher foot stretchers and a Dreher hollow carbon wing rigger. The molds were relocated to Maine in 2011 and the manufacturing method insures the same stiffness and weight, with an enhanced surface finish. Boats are outfitted with Dreher carbon rigging components made by us in our factory in New Hampshire. The carbon rigging parts are identical to what we sell to premium boat builders throughout the World. 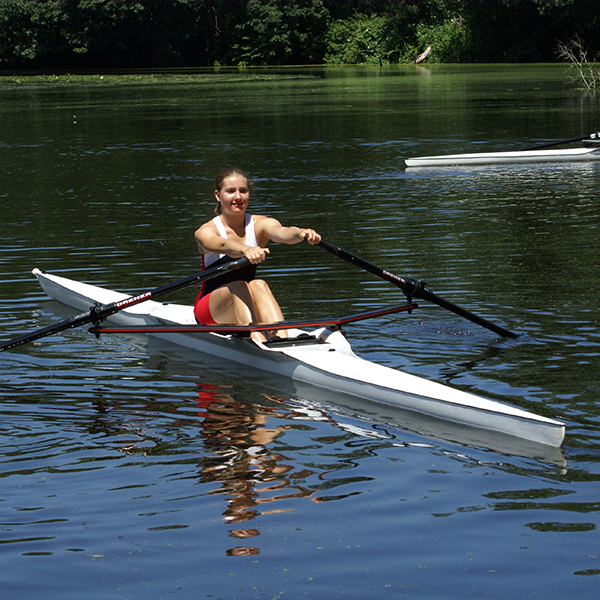 The FISA single provides the same rowing experience that you would see from some of the most expensive boats. The boats are available in bright white with black trim. Optimum Capacity / Maximum Capacity FISA: 180 lbs. ave./200 lbs max. / FISA II: 200 lbs. ave./220+ lbs. max. Hull Depth Between the FISA I and II FISA II: 1/2 inch deeper than the FISA. Dreher Carbon Seat Medium carbon twill seat top, 23 cm single action stainless steel ball bearing, medium high seat support. Dreher Foot stretcher Choices: F4 (with angled or flat shoe plate) or F5 (with or without shoe plate) with two choices of rowing shoes (black Ankaa or NewWave); or Snap-In Shoe plate on the F5 foot stretcher frame with On-Cloud shoes. Dreher Carbon Rigger Hollow carbon wing rigger (stern mounted). Color Bright White and black splash shield with a painted black trim stripe. Construction of Hull Multi-layer carbon construction with composite core, vacuum resin infused carbon hull reinforcements.